The next time you print a circuit, you will have to choose between a simple or an aligned print. 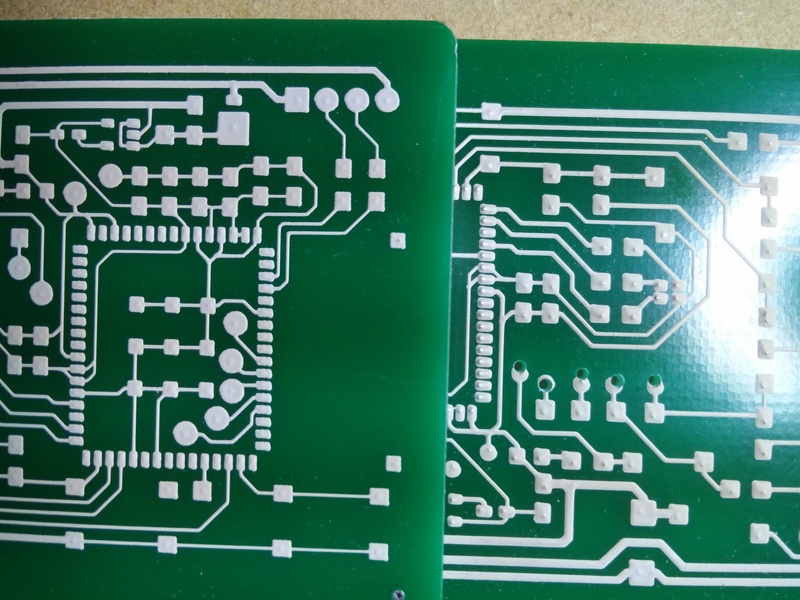 An aligned print will let you position the circuit by identifying two key features on the board. Just like in solder paste dispensing, the location of two points needs to be measured using the arrow keys. Important: For alignment purposes, the software will pick the two smallest pads that are farthest apart. It gives priority to pads with holes (thru holes or vias), followed by regular pads (SMT pads), followed by traces. 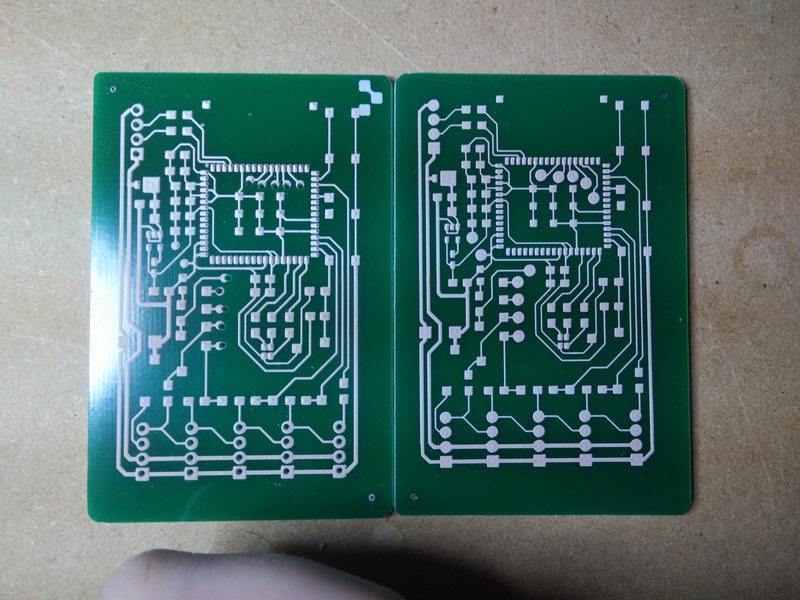 A double sided circuit consists of two separate prints: A simple print followed by an aligned print. During an aligned print you will have to locate the position of two holes. A user guide on double sided printing will be posted here. Over the past few weeks we've been experimenting with faster printing speeds. We realized we could increase the printing speed by 66% without any negative effects. A Hello World circuit now takes 3 minutes and 22 seconds to print! The software will automatically start using the faster print speed once it updates. 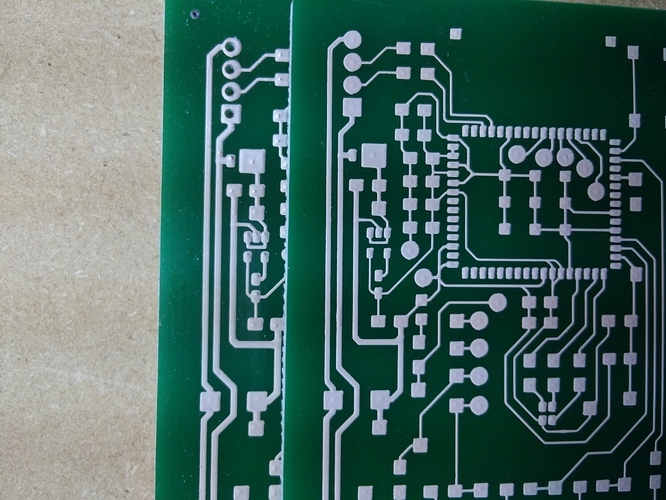 Similarly, very small thin pads will now be drawn as a single line, instead of a rectangle, this will help reduce the risk of shorting if you are printing fine pitch ICs. We have added Alt+C as a shortcut to bring up the console. This shortcut is more accessible in international keyboards and is more in line with the other shortcuts (like Alt + R, Alt + H). Thanks @Eriond for the tip! Release notes have been added to the app, when the app is updated they will be displayed automatically so you can stay in the loop. Previously, if you had rectangular pads with rounded corners the software would not be able to process them and would render a circle instead. We've patched the issue now. That is it for now, but if you have general feedback, questions or feature requests, please comment below. I have printed 7 boards so far, tweaking settings each time. Today's update (0.6.2 up from 0.5) really changed the ink flow. Previously I was dialing the flow rate to -18 and manually reducing to -22 when pads were being printed, and there was still significant make-out sessions happening. Today the flow was only -8 and anything lower resulted in broken traces. For the following images, yesterday's board is on the left and today's board is on the right! That's the smallest drill bit I have available: 66Y. I enlarged vias to 2mm diameter for today so that I can drill them with room to spare. Note the SOT23-5 package on the left side, vertical centerish - today's print is WAY cleaner, and I didn't have to intervene with flow adjustment. 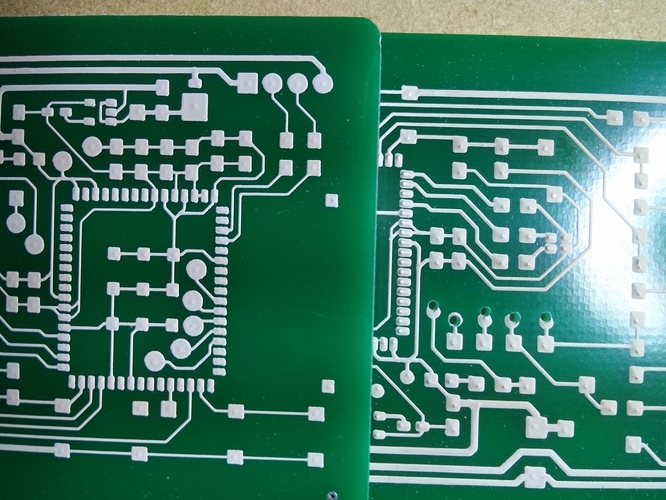 This last image has the boards flipped, oops - the drilled board is the old one. Come to think of it, I should have tried for an elevation shot to demonstrate the difference in pad height, as it is definitely noticeable. My off-center via drilling is a result of trying to figure out via diameter with my huge drill bit. I am using Kicad, and I'm not sure exactly why the vias (and through-hole pads) aren't being left hollow. Are they supposed to get filled in? If you're interested in investigating, the code is available over here. 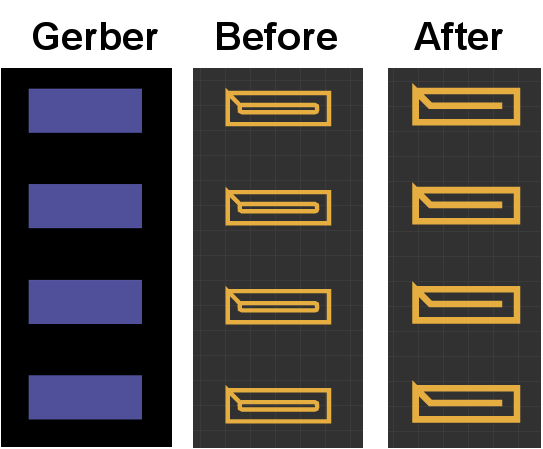 Kicad exports drill files as *.drl which is only a little annoying because I have to rename them to *.txt to get the software to recognize them. What an improvement! Love those side by side comparisons - thanks for sharing. I'll take a look at the *.DRL file and get back to you. Just attempted an aligned print, and the height probe stage failed. The probe descended too far into a drilled via, didn't retract far enough, continued its X/Y movement, got caught inside the edge of the via, retracted further, went WAY off-board, probed the hot plate, then halted with an error. The height probe was going well up until the last via probe - it probed the outer corners of the farthest pads, then did the board centers along the edges, then it probed around the edges of a few vias... and then it dipped straight into one of the middle vias and got caught. I have a feeling that this may have been caused by the size of my drills - I just measured my bit to be 0.8mm diameter. The code is still available on Github, with a freshly generated bottom layer. The drill file still doesn't seem to be doing anything, perhaps the lack of holes is messing the probe sequence up? I'm impressed to see that you're blazing the trail for double-sided printing, even without support docs! The user guides section for the aligned printing feature is in progress and should be released soon, but the approach that you were taking is exactly the process we follow. You're right that the missing drill locations are causing the probing problem. The V-one software will purposely avoid drills and holes when probing, to prevent running into the exact issue you saw - without these locations, it won't know whether it is probing a via or just another pad (which would be safe typically). It's quite unlikely that the probe is damaged, so you should be able to pick up where you left off as soon as we're able to resolve the problem with processing the .drl file - Jesus will be in touch as soon as we have a solution! I managed - to get your files working. It seems that in KiCad, the coordinate origin is in the top left (? ), so the Y axis coordinates for the drills all had negative values and we didn't take this into account. You'll notice that the drills are now compensated for in the software as expected. I ask because at the moment the software only compensates for holes only if the hole is completely enveloped by a pad. That's why you'll see some holes missing in the previous image. The fix will be rolled out in the next SW version. That is excellent, thank you for the troubleshooting help! I've made a few adjustments to the PCB - it looks like the drill marks are for the most recent board, and the PCB copper is the old version. This is notably different from the top-origin plotting found at https://github.com/emcniece/lamply-circuit/blob/master/Lamply.drl. Should Kicad users be mirroring the Y-axis? And finally, what gerber viewer do you use? Thanks again for the help! Just confirming that mirroring y-axis during Kicad drill file export does not get the V1 software to recognize the drills in the correct locations. http://viewer.tracespace.io/ is pretty useful for viewing gerbers and drill hole alignment! Should Kicad users be mirroring the Y-axis? That should not be necessary after the next SW update. As long as the origin location between the Gerbers and the drill file matches it should render fine. We use Gerbv to view gerber files. Its feature set is quite limited (you can't copy or paste traces/pads) but it has proven to be super useful for us. We can add the *.DRL extension no problem. psst @mewertow - what do you think the ETA is on the next software update? Just received a box of new tips, pretty stoked to get soldering again! Software update just released! Re-start the app, and you'll be on v0.6.4.